During this spring’s aldermanic run-off election in Uptown, the owner of Papa Ray’s Pizza & Wings starred in a “crime is down” ad piece for incumbent alderman James Cappleman. “My profits are up over 20%,” Matthew Villareal beamed. 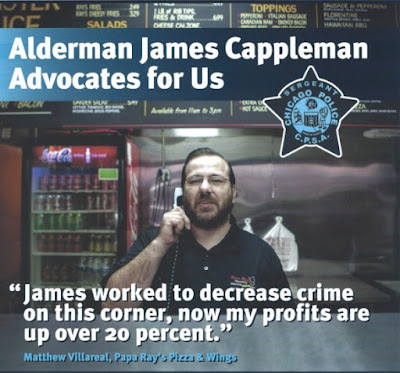 Those profits will be down slightly after one of Villareal’s delivery drivers was robbed of cash and several pizzas Friday night. A witness reported seeing four men in hoodies mugging the delivery driver in the 800 block of Agatite at 10:35 last night. The Papa Ray’s manager called 911 when the driver returned to the store. The driver described the robbers as five black men. One was over 6-feet tall, had dreadlocks, and wore a red shirt. One of the other men had a striped shirt. In November 2013, two men were shot outside of Papa Ray’s front door.